Adore Beauty is an official stockist of Lumira. Lumira was founded by Almira Armstrong in 2013. Armstrong wanted to bring her love of travel, design, and scents to an elegant line of home fragrances that delight the senses. Lumira candles incorporate fine, fragrant essential oils into a pure, natural soy wax base. Destination candles bring the exclusive scents of some of the world’s most beautiful locations to your home. Enjoy the fragrance of the tropics with the Balinese Ylang Ylang candle. This luxurious aroma invokes a feeling of romance and elegance with its unique combination of ylang-ylang, sandalwood, and bergamot. You do not have to stay home to enjoy a scented room. 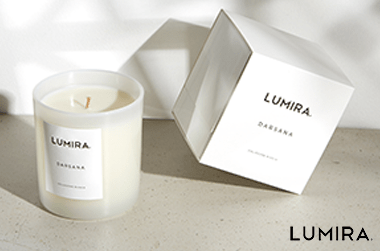 Lumira offers travel-size candles in fragrances such as exotic Oriental Jasmine, delicate Persian Rose, and unforgettably heady Tahitian Coconut. These travel candles contain the same high-quality soy wax and essential oils as the full-size versions. Each product is packaged in an elegant gold travel tin for mess-free transport. All Lumira candles are crafted with loving attention to detail inside and out. Designed by a team of internationally renowned perfumers, each item features a decorative exterior and is a true work of art. Lumira engages the imagination, stirring pleasant sensory memories, invoking warmth and comfort, and inspiring you to transcend the everyday. Atelier Lumira&apos;s quality is matched only by its impeccable aesthetic: bold, unique, and above all luxurious. Lace your life with evocative fragrance through the handcrafted products of Lumira. Showing 20 products of 24. Especially good for candles that have burned down inside the jar and not so easy to snip the wick with regular scissors. The scent is unique and I love it. After my second purchase I notice the product container had changed (longer and thinner) and It is now difficult to roll a sufficient amount of the oil.